Bald Eagles - Raptor Rehabilitation of Kentucky, Inc. The Bald Eagle has been our national symbol since 1782. Originally they occupied every corner of the continent, from southern Texas and northern Baja California to the edge of the arctic coastal plain, with an estimated population of about 250,000 individuals in 1800. They like the same prime waterfront territory that people like, however, and were often shot as a threat to livestock. In 1940 Bald Eagles were first federally protected from shooting in all areas except Alaska, where a bounty remained in place until 1953. This did not protect them from DDT insecticides, however, which polluted ground water and streams, including fish eaten by eagles. By 1962, they had disappeared completely in many areas. DDT caused the egg shells to weaken so they broke under the weight of the incubating female. The U.S. listed the Bald Eagle as endangered in 1967. There were only about 500 pairs of the southern race remaining in 1970, although the northern birds were doing a little better. DDT is still manufactured and sold to Third World countries, affecting birds that migrate. The adult Bald Eagle has a prominent white head and tail. "Bald" is an Old English term meaning white. The young birds do not grow white feathers until they are 5 years old, however. Until then, their heads are dark brown and their beaks and eyes are a darker yellow-brown color. Bald Eagles spend most of their time soaring, and many will stay perched on windless days. When they take off and land, it is into the wind, and during a typical hour of flight, the eagle will spend only 2 minutes flapping. Flapping expends great amounts of energy that must be replaced, upping food consumption. Bald Eagles feed mostly on fish and shot or crippled waterfowl, and will scavenge when other food is scarce, making them extremely susceptible to lead poisoning from sinkers and bullets. Although they are large birds, weighing between 5 - 14 pounds, they cannot take fish larger then about 6 pounds. They couldn't lift and fly with one that big. Occasionally they have been know to drown by trying to capture a fish that is too large. Bald Eagles prefer to nest in large trees with an open view of the area that are less than one kilometer from the edge of a large body of water. The nest itself is built an average of 82 feet from the ground and is the largest of any bird because they reuse and renovate old nests each year. One such nest was recorded as active for 35 years! Courting includes "sky dancing," a spectacular display involving chases of the female by the male, calling, and locking talons in midair. After the banning of DDT in 1972 (US) and a nationwide re-introduction effort in the 1970’s and 1980’s, the number of bald eagle nesting territories in Kentucky has steadily increased. Due to the high concentration of suitable habitat, the majority of eagle nests are located in western Kentucky. However, reports of Bald Eagles during the breeding season from central and eastern Kentucky are becoming increasingly common. The creation of large reservoirs statewide has provided habitat that was not available to eagles historically. Large rivers, creeks and wetlands provide additional nesting opportunities. Kentucky’s population of bald eagles met criteria set by the Southeast Bald Eagle Recovery Team for removal of the species from the federal list of threatened and endangered species. Hence, the species was officially delisted in August of 2007. However, bald eagles still remain protected by the Migratory Bird Treaty Act and the Bald and Golden Eagle Protection Act. The Kentucky Department of Fish and Wildlife makes a mid-winter count of eagle populations in the state conducting aerial (helicopter) surveys of eagle nests in March or April to determine the status of breeding territories. In 1986, the state had 1 (count it, ONE) nest; in 2013 the population had risen to 123 nesting pairs! 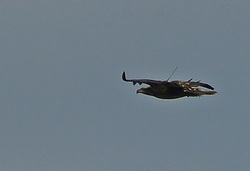 Additionally, several eagles have been fitted with radio transmitters to track their behavior all year long. You can keep up with this project at http://kyeagletracking.wordpress.com/ . RROKI rehabbed several of the birds being tracked. ‘Spirit’ is a female Bald Eagle hatched in captivity at the John Ball Zoo in Grand Rapids, Michigan in 1992. At seven weeks of age, she was sent to a Bald Eagle hacking project just outside Nashville. She was released at twelve weeks of age. Although she was a full-sized eagle, ready to leave the nest, her first jump from the hacking tower was not very graceful and she suffered a hairline fracture in her collarbone. She was immediately taken to the American Eagle Foundation for rehabilitation. After the fracture had completely healed, she was once again released into the wild from the Nashville area hacking tower. This time, she followed the hack tower attendant when she heard/saw the attendant coming to feed the other eaglets that were still in the tower. She then landed in the yard of the people who lived next to the hack site. She eventually flew off and out of Tennessee. Weeks later, she was found sitting on a lady’s trailer in Statesboro, Georgia, where she remained for three to four days. Georgia wildlife officials and a local falconer retrieved Spirit from the wild after she grabbed the lady’s dog in the hindquarters. Spirit, simply defending herself, was on the ground at the time when the barking dog quickly ran up to her. Spirit was found to be very hungry and getting weaker, so she was taken to the falconer’s for temporary care and then later transferred to the AEF for rehabilitation again. Spirit was determined to be a human imprinted bird. In 2010, during her bi-annual physical, a cataract was found in her left eye. She had laser surgery and now once again she has sight in that eye. Although her eyesight has dwindled over the years she is still a Spirited young eagle at heart. Aquila is the Latin word for eagle, and the name of our education Bald Eagle. We know more about Aquila than any other wild-raised bird because scientists banded him in the nest. He hatched at a nest in Saginaw Bay, MI, and was banded by US Fish and Wildlife on 5/13/93. In January, 1994, when he was 8 months old and making his first migration through Kentucky, a woman in the eastern part of the state shot him through the right shoulder with a high-powered rifle. When we arrived to pick him up, he was weak and emaciated, weighing only 5 lb. 4 oz. The usual weight for a Bald Eagle is 7 - 14 pounds. He had two wounds in his shoulder, one quarter-sized and the second dime-sized. He had been down on the ground long enough to develop a nasty infection in the area, resulting in bone deterioration in the shoulder joint. We treated the site until healed, which required irrigating the wound twice a day and administering antibiotics. Bone deterioration resulted in a permanent luxation (dislocation) of the joint, and as a result, he is unable to fly. In April 1994, Federal Fish and Wildlife officials found the woman who confessed to shooting the bird. She was prosecuted, but to what extent we do not know. 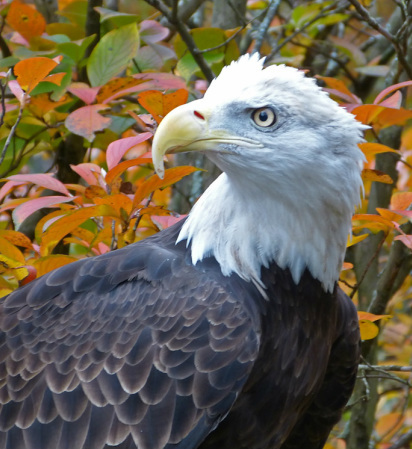 Aquila has now retired to the American Eagle Foundation in Dollywood, TN.